For other uses, see Duma (disambiguation). A duma (дума) was a Russian assembly with advisory or legislative functions. The term comes from the Russian verb думать (dumat’) meaning "to think" or "to consider". The first formally constituted duma was the State Duma introduced into the Russian Empire by Tsar Nicholas II in 1905 after the revolt of people against him demanding for the elected assembly. The Tsar dismissed the first duma within 75 days and re-elected second duma within three months. It was dissolved in 1917 during the Russian Revolution. Since 1993, the State Duma is the lower legislative house of the Russian Federation. Historians use the term Boyar Duma to denote the council of boyars and junior boyars collectively within the Russian Tsardom. In 1721 Peter the Great transferred its functions to the Governing Senate. Contemporary sources always refer simply to "the boyars" or to "the duma", but never to the "boyar duma". Originally there were ten to twelve boyars and five or six paddu. By 1613 the duma had increased to twenty boyars and eight okol'nichii. Lesser nobles, "duma gentlemen" (dumnye dvoriane) and secretaries, were added to the duma and the number of okol'nichii rose in the latter half of the 17th century. In 1676 the number of boyars increased to 50 - by then they constituted only a third of the duma. Under the reign of Alexander II, several reforms were enacted during the 1860s and 1870s. These included the creation of local political bodies known as zemstvoes. All owners of houses, tax-paying merchants and workmen are enrolled on lists in a descending order according to their assessed wealth. The total valuation is then divided into three equal parts, representing three groups of electors very unequal in number, each of which elects an equal number of delegates to the municipal duma. The executive is in the hands of an elective mayor and an uprava, which consists of several members elected by the duma. Under Alexander III, however, by laws promulgated in 1892 and 1894, the municipal dumas were subordinated to the governors in the same way as the zemstvos. In 1894 municipal institutions, with still more restricted powers, were granted to several towns in Siberia, and in 1895 to some in Caucasia. 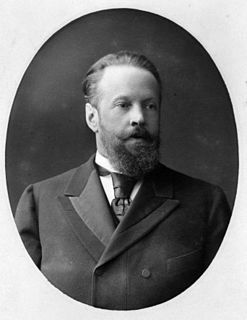 Under the pressure of the Russian Revolution of 1905, on 6 August 1905, Sergei Witte issued a manifesto about the convocation of the Duma, initially thought to be an advisory organ. In the subsequent October Manifesto, Nicholas II pledged to introduce basic civil liberties, provide for broad participation in the State Duma, and endow the Duma with legislative and oversight powers. However, Nicholas II was determined to retain his autocratic power. Just before the creation of the Duma in May 1906, the Tsar issued the Fundamental Laws. It stated in part that the tsar's ministers could not be appointed by, and were not responsible to, the Duma, thus denying responsible government at the executive level. Furthermore, the tsar had the power to dismiss the Duma and announce new elections whenever he wished. At this first meeting of the Duma members proposed that political prisoners should be released, trade unions given rights and land reform be introduced. Nicholas II rejected these suggestions and dissolved the assembly in July, 1906. The imperial State Duma was elected four times: in 1906, twice in 1907, and in 1912. The State Duma (Russian: Государственная дума, Gosudarstvennaya Duma, common abbreviation: Госдума, Gosduma) in Russia is the lower house of the Federal Assembly of Russia (parliament), the upper house being the Federation Council of Russia. Under Russia's 1993 constitution, there are 450 deputies of the State Duma (Article 95), each elected to a term of four years (Article 96); this was changed to a five-year term in late 2008. In previous elections of 1993, 1995, 1999 and 2003 one half of the deputies were elected by a system of proportional representation and one half were elected by plurality in single member districts. However, the 2007 Duma elections were carried out in a new format: all 450 deputies were elected by a system of proportional representation. Russian citizens at least 21 years old are eligible to run for the Duma (Article 97). ^ Paul Bushkovitch, Peter the Great (Rowman and Littlefield, 2001). ^ Gustave Alef, "Reflections on the Boyar Duma in the Reign of Ivan III", The Slavonic and East European Review, 45, 104 (1967): 76–123. ^ Stearns, Peter (2007). World Civilizations the Global Experience. New York: Pearson Education. p. 620. ISBN 0132206994. ^ "The Duma". Retrieved 8 November 2016. The Russian Revolution of 1905 was a wave of mass political and social unrest that spread through vast areas of the Russian Empire, some of which was directed at the government. It included worker strikes, peasant unrest, and military mutinies. It led to Constitutional Reform including the establishment of the State Duma, the multi-party system, and the Russian Constitution of 1906. The October Manifesto, officially "The Manifesto on the Improvement of the State Order", is a document that served as a precursor to the Russian Empire's first Russian Constitution of 1906, which would be adopted the next year. The Manifesto was issued by Tsar Nicholas II, under the influence of Sergei Witte (1849-1915), on 30 October [O.S. 17 October] 1905 as a response to the Russian Revolution of 1905. Nicholas strenuously resisted these ideas, but gave in after his first choice to head a military dictatorship, Grand Duke Nicholas, threatened to shoot himself in the head if the Tsar did not accept Witte's suggestion. Nicholas reluctantly agreed, and issued what became known as the October Manifesto, promising basic civil rights and an elected parliament called the Duma, without whose approval no laws were to be enacted in Russia in the future. According to his memoirs, Witte did not force the Tsar to sign the October Manifesto, which was proclaimed in all the churches..
Count Sergei Yulyevich Witte (Russian: Серге́й Ю́льевич Ви́тте, translit. Sergéj Júl'jevič Vitte, pronounced [ˈvʲitɨ];, also known as Sergius Witte, was a highly influential econometrician, minister, and prime minister in Imperial Russia, one of the key figures in the political arena at the end of 19th and at the beginning of the 20th century. The Constitutional Democratic Party, also called Constitutional Democrats and formally the Party of People's Freedom, was a liberal political party in the Russian Empire encompassing constitutional monarchists and moderate republicans. Party members were called Kadets from the abbreviation K-D of the party name. Konstantin Kavelin's and Boris Chicherin's writings formed the theoretical basis of the party's platform. Historian Pavel Miliukov was the party's leader throughout its existence. The Russian Constitution of 1906 refers to a major revision of the 1832 Fundamental Laws of the Russian Empire, which transformed the formerly absolutist state into one in which the emperor agreed for the first time to share his autocratic power with a parliament. It was enacted on 6 May [O.S. 23 April] 1906, on the eve of the opening of the first State Duma. This first-ever Russian Constitution was a revision of the earlier Fundamental Laws, which had been published as the Code of Laws of the Russian Empire in 1832. It was granted during the Russian Revolution of 1905, in a last-ditch effort by the imperial government to preserve its own existence and keep the nation from sliding into all-out anarchy. The Union of Russian People (URP) (Russian: Союз Русского Народа, translit. Soyuz Russkogo Naroda was a loyalist extreme right nationalist political party, the most important among Black-Hundredist monarchist political organizations in the Russian Empire between 1905 and 1917. The State Duma, commonly abbreviated in Russian as Gosduma, is the lower house of the Federal Assembly of Russia, while the upper house is the Council of the Federation. The Duma headquarters are located in central Moscow, a few steps from Manege Square. Its members are referred to as deputies. The State Duma replaced the Supreme Soviet as a result of the new constitution introduced by Boris Yeltsin in the aftermath of the Russian constitutional crisis of 1993, and approved by the Russian public in a referendum. The State Council was the supreme state advisory body to the Tsar in Imperial Russia. From 1906, it was the upper house of the parliament under the Russian Constitution of 1906. The Moscow City Duma is the Russian regional parliament in Moscow, the unicameral City Duma of the Russian capital city of Moscow. As Moscow is one of three federal cities, the city duma's legislation can only be overridden by the mayor and the federal government. 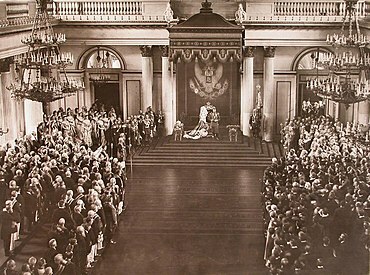 The State Duma or Imperial Duma was the Lower House, part of the legislative assembly in the late Russian Empire, which held its meetings in the Taurida Palace in St. Petersburg. It convened four times between 27 April 1906 and the collapse of the Empire in February 1917. The First and the Second Dumas were more democratic and represented a greater number of national types than their successors. The Third Duma was dominated by gentry, landowners and businessmen. The Fourth Duma held five sessions; it existed until 2 March 1917, and was formally dissolved on 6 October 1917. Legislative elections were held in the Russian Empire from 26 March 1906 till 20 April. At stake were the 478 seats in the State Duma of the Russian Empire, the legislative assembly. Election for the First State Duma, which only ran from 27 April to 8 July (O.S.) 1906, returned a significant bloc of moderate socialists and two liberal parties which demanded further reforms. For this reason, it is sometimes called the Duma of Public Anger. The Vyborg Manifesto was a proclamation signed by several Russian politicians, primarily Kadets and Trudoviks) of the dissolved First Duma July 22nd 1906. 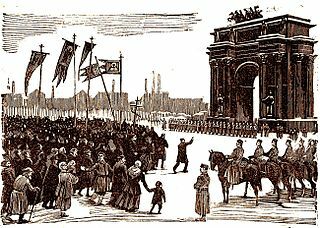 The Coup of June 1907, sometimes known as Stolypin's Coup, is the name commonly given to the dissolution of the Second State Duma of the Russian Empire, the arrest of some its members and a fundamental change in the Russian electoral law by Tsar Nicholas II on 16 June [O.S. 3 June] 1907. This act is considered by many historians to mark the end of the Russian Revolution of 1905, and was the subject of intense subsequent debate as to its legality. It also created a fundamental shift in the makeup of future Dumas in the Russian Empire: whereas previous laws had given peasants and other lower-class people a larger proportion of electors to the Duma, the new law transferred this to the propertied classes, in an effort to avoid election of the large number of liberal and revolutionary deputies who had dominated the First and Second Dumas. Although it largely succeeded in this objective, it ultimately failed to preserve the Imperial system, which ceased to exist during the Russian Revolution of 1917. The February Revolution, known in Soviet historiography as the February Bourgeois Democratic Revolution and sometimes as the March Revolution, was the first of two revolutions which took place in Russia in 1917. The Duma of Chukotka Autonomous Okrug is the highest permanent and only legislative body of the Chukotka Autonomous Okrug. Together with the executive and judicial branches, the Okrug's Duma is vested with power to control the Okrug's own affairs with high levels of autonomy from Moscow. All members are elected by public vote and are titled as deputies. Deputies currently have a five-year tenure. The Sakhalin Oblast Duma is the highest permanent and only legislative body of the Sakhalin Oblast. Together with the executive and judicial branches, the oblast's legislative assembly is vested with power to control the oblast's own affairs with moderate levels of autonomy from Moscow. All members are elected by public vote and are titled as deputies. The tenure of the deputies are currently 5 years long.